As I worked on the TNT AirCoil DIY Interconnect write up I did a lot of thinking and reading around the question of how the capacitance affects frequency response and how low does the interconnect capacitance really have to be. This is the result of that reflection. 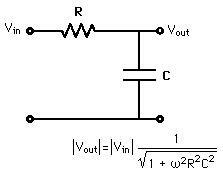 For the purposes of analyzing the frequency response an interconnect circuit can be modelled as a Resistance-Capacitance (RC) low pass filter. The resistance of the cable is negligible compared to the resistance of the source so R becomes the source resistance and C is the capacitance of the interconnect cable. From the equations above we see that for any given source and cable combination, when the frequency increases to the point where the second term under the square root becomes non-negligible, the voltage (Vout) starts to decrease. However, because the capacitance value is extremely small, (for example 75 picofarads is 0.000000000075 Farads) this typically only becomes a factor at the high end of the audio frequency spectrum. At the upper end of the audio frequency spectrum, the ear can't hear a difference in sound level which is less than 0.4 dB. (about 0.5 dB for volumes below 70 dB) Taken from a paper from Illinois University, with permission for non-commercial use. What about the phase shift? An interconnect cable with a capacitance value that yields a frequency drop off of less than 0.4 dB at 17 kHz probably meets the hearing capability for the vast majority of audiophiles. Using the formula shown above, for a source impedance of 600 ohms (my preamp), in order to attain a frequency roll-off of -0.4 dB or less at 17 kHz an interconnect would require a capacitance value of about 5 nano-Farads or less. If the source impedance is in the range of 100 ohms (which is common), then to get the same performance the cable capacitance would have to be less than or equal to about 9 nano-Farads. The audiophile zeitgeist dictates that no detail is too small or too insignificant to be neglected in the search for audio nirvana. Manufacturers certainly contribute to this mindset with their competition for the consumer's dollars. But if something is inaudible to most humans why do we need to worry about it? Yes, I know, many people argue that removing information in the music signal above the audible range can affect the signal in the audible spectrum, well if one does the math I am sure that can be illustrated, however the question remains; that effect is very far below the audibility threshold so why care about it? It turns out that it is quite feasible to build a DIY interconnect with a capacitance of much less than 1.0 nanofarad thus resulting in a flat response to well over 20 kHz. See TNT AirCoil DIY interconnect for more info. References: Giddings, G.H. Philip, (1990). Audio Systems Design and Installation. Butterworth-Keinemann, Woburn, Ma.